Grow a full and healthy lawn for you and your family to enjoy this summer. With introductions and the welcome party out of the way, it’s time to get this blog really started with some of the news, tips, tricks, trends, and education that we promised when we launched a few weeks ago. 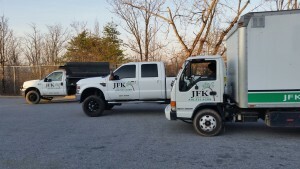 We call ourselves JFK Lawn & Landscape, so why not start at the beginning? Spring is here and summer isn’t far behind (you know how the seasons work), so let’s get that lawn ready for lazy days in the shade, the romping of youngsters, delightful gifts from the dog, and the intense summer heat. Without further ado, have some lawn care tips! The first step in lawn care is, well, having a lawn to care for. Whether your grass is a little sparse after that harsh winter, or it was never that great looking to begin with, now is the time to right that ship. For starters, your lawn will be happiest and healthiest with 6”-12” of soil that’s not too compacted, full of important nutrients, and drains well. You need to know what species of grass grows best on your property, and spread those seeds annually (in late summer or early fall once the lawn is well-established) to ensure that fresh, healthy grass is always there to make your lawn fuller and greener. Of course, you may not have the time or patience to literally watch the grass grow. Growing a new lawn from seed can take 14-18 months. Ain’t nobody got time for that. In this case, sod saves the day. After laying quality sod, you’ll have a full and thick lawn to care for in a matter of a few weeks. What’s that? That all sounds like a whole lot of work? Well then boy do we have good news. Everything above is part of our array of turf enhancement services. Click that link right there to visit the services page for a little more information. Now that we’ve gotten that lawn fully established, let’s get to the lawn care tips. Aside from regular overseeding, aeration is another one of our turf enhancement services that can really bring a drab lawn to life. As far as lawn care tips go, the most important thing you can do is give it regular attention. Anything left unloved will turn against you eventually, so it’s important to show your lawn some lovin’ with regular haircuts to keep it fresh. Mowing often is about more than aesthetics — it helps keep the grass healthy and encourages more growth. Lastly, unless you’re getting about 1”-2” of rain every week (which you probably aren’t in Central Maryland), it’s a good idea to water your lawn regularly. We recommend one hefty watering session a week, rather than smaller amounts doled out over the course of the week. Overwhelmed at all those new chores you just acquired? More good news. Check out our lawn maintenance service page. If the “Field of Dreams” part of the title is what caught your eye, then this is the section for you. If your lawn is already pretty full and healthy, you may be striving for that extra mile in landscape design. You know how ballparks have awesome patterns laid right there in the outfield? It’s a common myth that this is achieved by mowing to different lengths or planting different species of grass. It’s actually simply a matter of bending/pushing the grass in different directions to reflect the sunlight differently. Lawn rollers can be bought online or at your local lawn care store, or you can jimmy-rig your own. Here’s an awesome guide for getting the Field of Dreams look, and an instructable for building your own lawn striper. This entry was posted on Tuesday, May 10th, 2016 at 10:41 am. Both comments and pings are currently closed.